Advisor Pump and Dump is a fully automatic trading EA, created by a trader for traders. The main strategy - "Buy cheap, sell expensive." Opening orders occurs after a significant increase/fall in prices. You probably noticed a significant pullback of the price in the opposite direction after sharp movements in the market, then so-called "hairpins" have drawn. The adviser catches moments of strong growth or fall and enters the market, based on these signals.I explain particularly in the video and in the screenshots. IMPORTANT! Some buyers ask me how to speed up testing in the MT4 strategy tester? ANSWER - To speed up testing, roll up the info panel on the test chart. A lot of attention was paid to money management and risk management in the adviser. The built-in Risk-Management mechanism can stop trading in time and save capital with the help of initially setting the maximum permissible level of account subsidence. Monitoring the stoppage of trade. An advisor can suspend trading for a predetermined time interval in case of exceeding the risk management. For ease of monitoring, a signal on the occurrence of an event will come directly to your mobile phone using Push Notification. Built-in mechanism for multiplying the profit of orders. Inclusion mechanism for increasing profits occurs in the case of following the price of the trend. Instant notifications of Risk manager for the status of the account on the mobile phone, using Push messages. Percent_price_change - The percentage of price change when the orders will be opened. Multiplication_Profit = true / false - use of the profit multiplication parameter; when this parameter is enabled, orders are added only by trend. Two side = true / false - If this option is enabled, the positions are opened by the fact of the presence of the signal, without waiting for the orders to close on the opposite signal. First Lot - The initial lot of the order. When it sets to 0, the volume calculation will occur according to the percentage of balance function (Lot_Proc_from_Balance). Lot_Proc_from_Balance - Calculation of the volume of orders depending on the balance with the subsequent automatic increase / decrease. If you set it to 0, the volume calculation will be performed using the First Lot option. 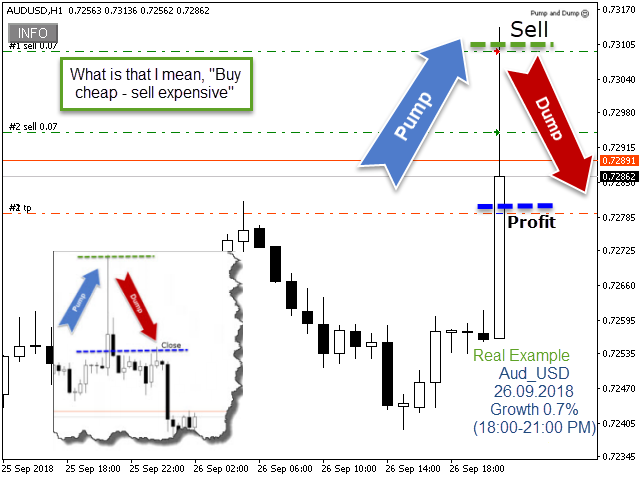 TP_pips - the value of the take profit in pips. Plus - the number of items, added to the level of lossless positions when closing a series of orders. Magic number - the magic number for identifying orders. Slippage - allowable slippage in pips to open a trade. Pause_hours_ after_error - the number of hours of advisor’s stop after exceeding the maximum drawdown limit. Delete Orders = True / false - when this option is turned on,and if the maximum drawdown is exceeded, the EA will delete all orders and stop the trade by notifying you with a Push notification. The recommended deposit with a starting lotto is 0.01 from 1000 USD or 1000 Cents. It is important to know, that while using the Expert Advisor on several pairs, it is necessary to change the value in the Magic number field. When using the function Fist Lot, I recommend to take a 0.01 lot for every $ 2,500 for the calculation. Good and fast support.All previous positions have been closed with a profit.I'll call you again after a month. Удобно настраиваемый бот, гибкая торговая стратегия. Very good EA and very serious programmer. Good help with setup and fast support and good advises during the way. Thumbs up! *** Update 13 Feb 19. Still going strong and stable. And im running on 1:30 leverage account EU/US regulated and that makes it even harder. Low margin and stable profits. Обновляю отзыв. Торговля идет в плюс. Автор помог в настройках. 5 звезд! The programmer helped to set up the EA correctly, provided a set of files. He also explain the meaning of the parameters in details, so that I could adjust the setting in different situation. Sergei’s blog and his trading experience is definitely rich and informative! He’s willing to chat and explain to me how he’s strategy works too. I been wanting to find a buy Low/sell high and this strategy suits my liking! He’s helped me with setup through teamviewer and he has good sets which he is generously sharing! Added check for the relevance of quotes. Corrigida várias modificações nos pedidos de Take Profit. Adicionadas notificações push sobre como exceder o gerenciamento de riscos, com o parâmetro Delete Orders = false.